Before she became known as the woman who enticed a king from his throne and birthright, Bessie Wallis Warfield was a prudish and particular girl from Baltimore. At turns imaginative, ambitious, and spoiled, Wallis's first words as recalled by her family were "me, me." From that young age, she was in want of nothing but stability, status, and social acceptance as she fought to climb the social ladder and take her place in London society. As irony would have it, she would gain the love and devotion of a king, but only at the cost of his throne and her reputation. 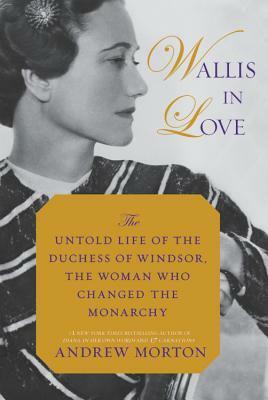 In WALLIS IN LOVE, acclaimed biographer Andrew Morton offers a fresh portrait of Wallis Simpson in all her vibrancy and brazenness as she transformed from a hard-nosed gold-digger to charming chatelaine. Using diary entries, letters, and other never-before-seen records, Morton takes us through Wallis's romantic adventures in Washington, China, and her entrance into the strange wonderland that is London society. During her journey, we meet an extraordinary array of characters, many of whom smoothed the way for her dalliance with the king of England, Edward VIII. Full disclosure... the knowledge I had about Wallis Simpson before reading this book could have fit on a post-it and came mostly from my grandmother's mutterings about her leading the king astray. Now my grandmother was generally a very open minded and supportive woman but her opinion about Wallis was pretty clear to me as a child so I was determined to make up my own mind reading this "untold" story by Andrew Morton. I learnt a lot about Wallis Simpson from her childhood to her younger self and older self, when she was Duchess of Windsor, but I don't really feel like I know her (the human being) any better than before and I certainly don't feel as if I like her. Edward was clearly a man of with many troubles and he appears to have attached himself on to Wallis and used her as a life raft. She didn't object until it became more like an anchor. I was also completely confused a lot of the read and had to force myself not to give up at times. There were many, many (many) people to try and keep track of and most of them had multiple names. There didn't appear to be much flow to the "story" but was more a series of facts, places and names in some sort of chronological order. If you are a Simpson historian then this will likely not provide any "news" to you and if you are a newbie like me then the slog may not be worth it- but in the end I feel able to at least have my own opinion on how things came to be.